It would be remiss of us to talk about the latest integrated Harrington Seed Destructor (iHSD) research without acknowledging the challenges with this new machinery during the 2017 harvest. It was frustrating for everyone, but the researchers, manufacturers and suppliers are playing the long game, and they are dedicated to succeeding in the long run. Recent research by Michael Walsh commenced at AHRI and was completed at Sydney University with help from John Broster at Charles Sturt University (CSU), shows that despite the problems that have been experienced with the new machines, iHSD mills are passing the research tests with flying colours. Weed seed kill increases with mill speed and 3000rpm is the accepted optimal speed. 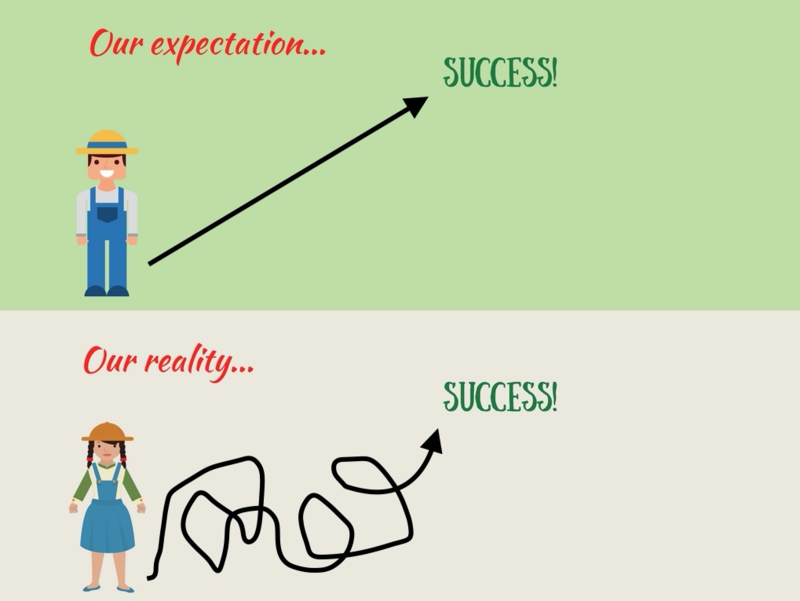 Researching harvest weed seed control isn’t easy and it’s certainly not glamorous! 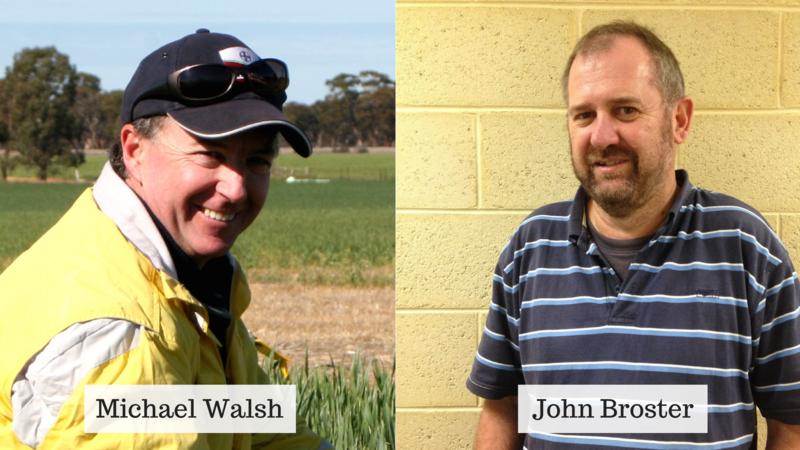 Michael Walsh from the University of Sydney (formerly AHRI) and John Broster from CSU have spent many hours sifting through huge bags of chaff laced with coloured weed seeds to confirm the iHSD works on a large range of weed species under a range of conditions. Readers don’t generally care too much for scientific methods so we won’t go too deep into the detail, but it’s important to know this research was done using a stationary test mill as shown in the diagram below. Chaff laced with coloured weed seeds is placed on a conveyor belt that is fed into an iHSD mill with the processed material caught in a mesh bag. A team of eager, well-paid students then spent months sifting through bags of chaff to find any weed seeds for germination testing to see if they had survived their trip through the mill. The amount of chaff used in the testing has been calculated to simulate harvesting wheat at 35 tonnes/hour. For every tonne of wheat grain harvested about 300kg of chaff is produced. Therefore, when harvesting 35t/hour, 10,500kg of chaff is produced per hour. Each mill in a twin-mill iHSD system must, therefore, process 1.5kg chaff/second. This picture shows the damage inflicted on weed seeds from the iHSD mills. 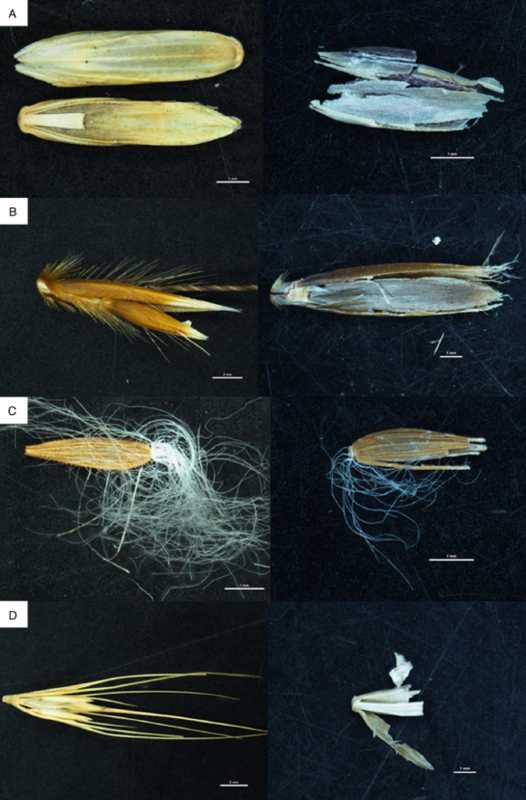 HSD mill unprocessed (left photo) and processed (right photo) seed of (A) Lolium rigidum, (B) Avena fatua, (C) Sonchus oleraceus, and (D) Hordeum vulgare. Previous research has focused on four key Australian weed species. 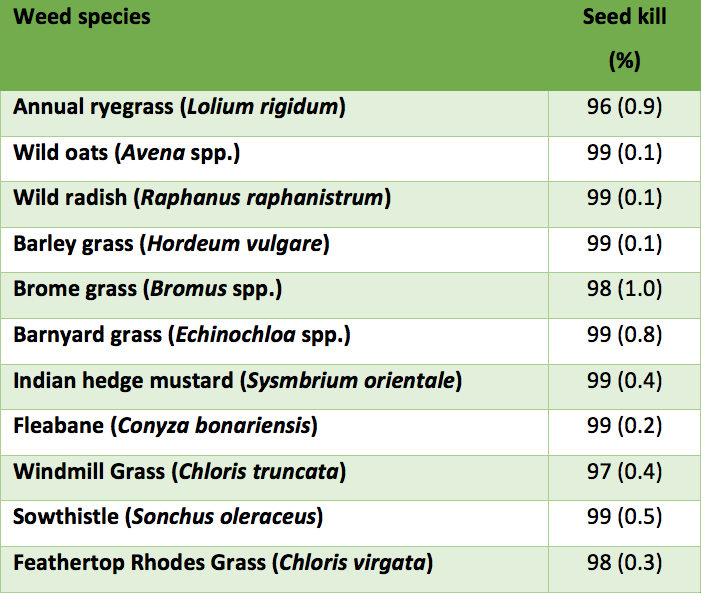 This study dug a little deeper and found that the iHSD mill was effective on 11 different weed species as can be seen in the table below. Other international studies are currently underway assessing weed kill of a wide range of species, with encouraging results. Table 1. Percentage destruction of the seed of 11 weed species of Australian cropping used in stationary testing of the iHSD mill. Figures in brackets are the standard errors for the mean of eight replicates. 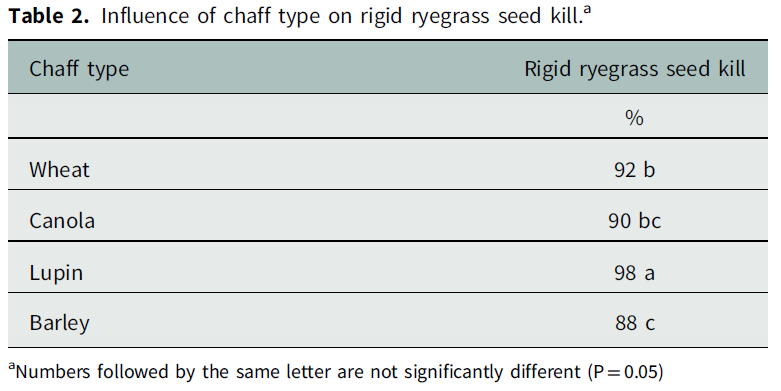 The table below shows that there are small differences in ryegrass seed kill between four crop types. However, other trials conducted in the field during commercial grain harvest achieved 99% kill of ryegrass, wild radish, brome grass, and wild oat while harvesting canola or barley. 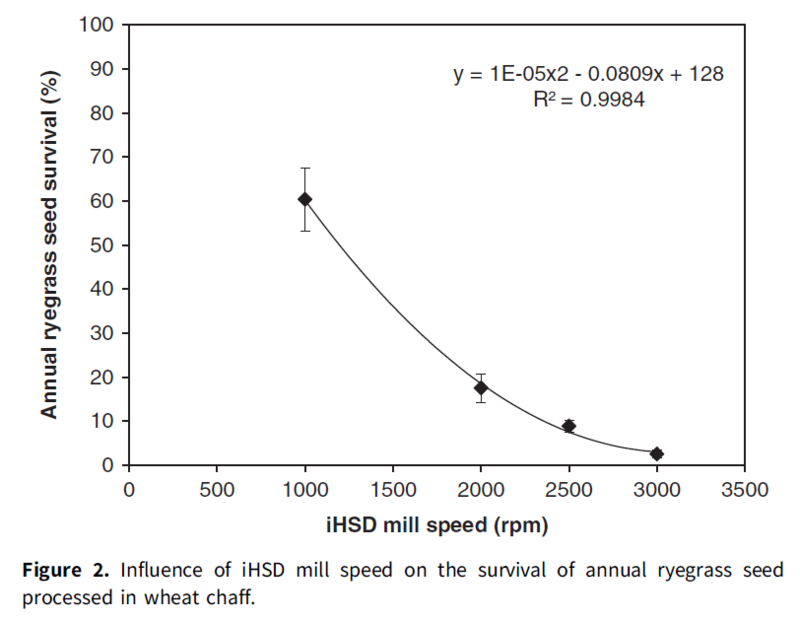 Essentially, it’s fair to say that the iHSD mill is effective in all crop types tested so far. A small increase in mill speed requires a large increase in horsepower to drive the mill, so we need to make sure we are not overdoing it or we will be costing growers time and money with no additional benefit. The graph below shows how the researchers and developers of the iHSD, DeBruin engineering, settled on the 3000rpm mill speed. The researchers measured ryegrass seed kill at 10, 12, 14 and 16% moisture. Seed kill was 92% at the lower moisture levels (10 and 12%) and dropped to 88% for the higher moisture levels (14 and 16%). The iHSD had some challenges with bearings and excessive wear of the mills, amongst other smaller issues during the 2017 harvest, but we shouldn’t lose sight of the big picture. The research is outstanding, the challenge now is to ensure that the machinery develops into a reliable, effective tool, because a large portion of the world’s crops need it. 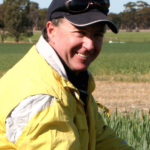 Has herbicide resistance in ryegrass in WA plateaued?